This is a guest blog post by Clark University student Charline K, participant on the spring 2017 CGEE semester program “Nation-building, Globalization, and Decolonizing the Mind” in Namibia & South Africa. Thanks to Charline for the wonderful reflection and photos! During my time in southern Africa, I was able to learn many important theories and concepts. This experience also allowed to grow and experience things that I would not have in the United States. I will share two experiences that helped me reflect inwardly about topics in my field of study; International Development and Political Science and myself. One of the many experiences that were rewarding to me were the rural homestay in Khorixas, Namibia and my urban homestay in Katutura in Windhoek, Namibia. The Center for Global Education and Experience (CGEE), prides itself on homestays being an important component of the program. 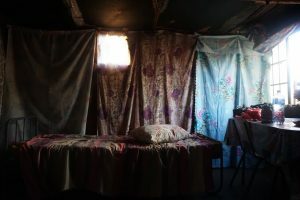 The program includes three homestays, two urban homestays in Soweto, Johannesburg, and Windhoek, Namibia, as well as one rural homestay in northern or southern Namibia. 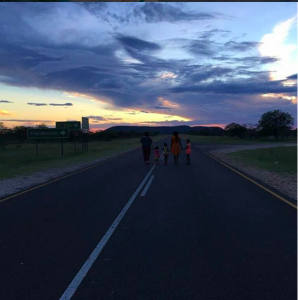 This year, our rural homestay was located in southern Kunene region, a town of 6,000 inhabitants called “Khorixas”. During my rural homestay, the host family that I was paired with mainly discussed political parties and issues faced by rural households. For the most part, development is always linked to politics. Therefore, when we discussed political issues that the farm and the area were facing, I was able to get a sense of some of the development issues that the community faced. When discussing political issues with my host dad, he alighted to the incompetence of the government to provide basic services to its citizens. My host father stated that as a result of budget cuts, only 10 portable toilets were installed in the Khorixas farms as opposed to the 100 that were supposed to be installed. Development is the process of being development, however, when the government fails to provide these basic services to its citizens then it fails to protect the health of these citizens. As a result, poor sanitation could lead to problems that could also affect to worker productivity and economic development of the respective country. While my host father expressed discontent with the incompetence of the government, he still claimed to be a SWAPO supporter because of its history. Although Namibia gained independence some 27 years ago, it was interesting to see how the loyalty to the party that was at the forefront for the fight for independence remains high. My host father taught me a lot about the SWAPO party and this gave me an insight on why SWAPO does not face a strong opposition. This inspired me to be more engaged and speak out when people are not provided the basic services they need. While taking classes and going on excursions, I was also able to take what I was learning in the classroom to analyze and assess what was actually going on in the “real world”. During the CGEE Spring 2017 program, I took the Race and Resistance class. While learning about the past dynamics of race in southern Africa it was interesting to experience how race operated in the present day, specifically in Namibia. From my experience, it seems as though Namibia is grappling more with tribalism issues than racial issues, not to undermine the role race plays in the country. This nevertheless is a legacy of the apartheid regime. My urban host mother in Katutura grew up during apartheid and discussed her experiences with me every night at the dinner table. 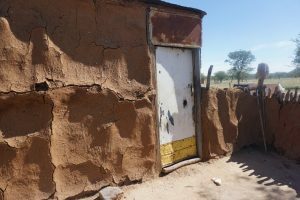 When she was young, they were forcibly removed from their residence in what is now known as Hochland Park to Katutura by the South African administration. This area at the time was known as “Old Location.” Before residents were relocated from the Old Location to Katutura, many tribes were living together harmoniously. It was only after they were relocated to Katutura, that designated areas were established for people of different tribal groups such as the Ovambo, Damara, Ovaherero etc. The Old Location became a place for white settlements. My host mother stated that it was difficult being separated by the different tribal groups because they were used to living together. The idea of having different groups living in separate areas was in order to “divide and concur”. As a result of this separation of tribes, there was a lot of “us” vs. “them” rhetoric among the Namibians I encountered. Additionally, the national government, South West Africa People’s Organization (SWAPO) mainly led by the Ovambo tribe has been viewed as biased by other tribes. My host mom’s friend who is from the Damara tribe stated that “SWAPO only care about their people.” Another example of this is the “Struggle Kids” who are Namibians who fought during independence. My host mom who is also Damara stated that the “Struggle Kids” are always looking for a handout. She stated that although SWAPO provided job opportunities for them, they only wanted jobs that they did not qualify for. Tribal and ethnic tension continues to be a cause of political instability and other issues in many parts of Africa. Learning more about these dynamics attached with its history provided a lot of context to some of the books that I have read. The rural and urban homestay experience was like no other experience I have had in my life. I was able to live on the farm and learn about different ways people sustain life as well as their views on political and historical issues. Additionally, these experiences exposed me to things I would not have learned in the classroom. Experiential learning is now something that I value.